Also, before I forget, you can follow us on twitter @reddishnews or like us on facebook. Saturday 8th December sees a members’ kids disco there from 2pm – 6pm. 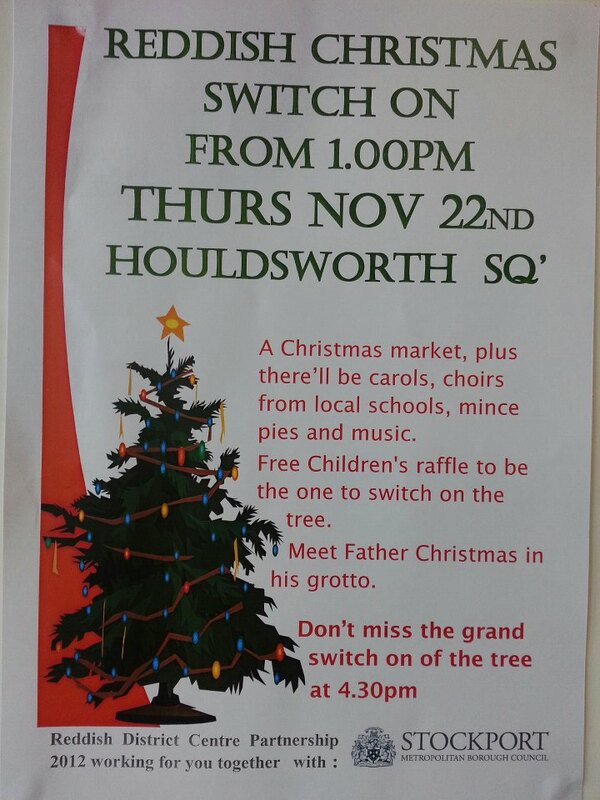 Tickets are only £3 per adult £1 per child. Maximum age 10. Tickets on sale now. I know you’re thinking the same as me, why isn’t there a place that plays Taylor Swift’s We are never ever getting back together on repeat for four hours on a Saturday afternoon? I don’t know but I wish there was. If a kids disco isn’t what you’re looking for, then on Wednesday 12th December, they’re also holiday a ladies only Ann Summer’s event. There’s also a female comedian performing (her own material, not with the merchandise – I think) and tickets for the event cost £3. Available from HWMC now. Kutz hairdressers in Reddish are doing an offer of COLOUR / FOILS cut & blow for only £30. I have no idea at all what this means as I’m bald. 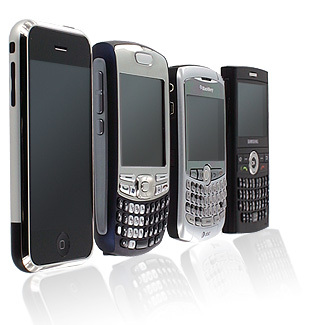 However, if you want more information then contact them on 0161 480 4065. The first person to go on their facebook page and then e-mail me with a funny comment such as “don’t worry Jez, they also to stitch in hair extensions LOL” wins a rubbish prize from my desk. Currently looking like a jar of aniseed rock purchased in late 2011. Seeing as we’re already talking hair, Jennifer Edwards Hairdressing have sleep in rollers back in stock. I have no idea what these are either. In retrospect, I should’ve found someone who knows about these things to do these posts. If you do know what sleep in rollers are and they sound like something you’d like, you can contact them on 0161 442 2124. The Houldsworth Arms is looking for new staff. You need to be experienced, honest reliable and most of all flexible about your working hours as you will not have set days to work you must be able to change the kegs in the cellar. Please send in your cv and references. If you’re feeling all festive, then Ali’s florist, 583 Gorton Road are doing Christmas wreaths. She says ‘all our holly wreaths are handmade.We make well over 300 and we always sell out every year,so please order your holly wreath or call in to collect. Prices same as last year.All wreaths are dressed, if you want plain one just request we can arrange that, no problem SMALL £8.99 MEDIUM £11.99 LARGE £14.99 LUXURY £19.99’ Call 0161 223 4477 or visit their website for more info. 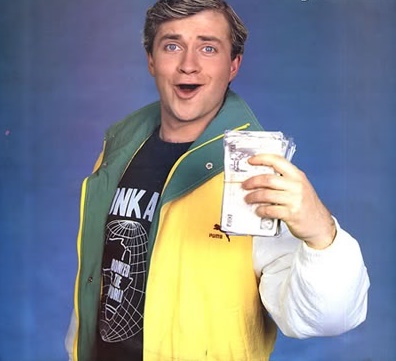 Again, if any of the businesses featured above fancy saving me loads of time by getting a business profile or simply e-mailing in their news that would be fab. So many things to catch up on in Reddish at the moment so please accept my apologies for those that I have missed/forgotten. If you have something you want me to put up here then please e-mail news@reddishnews.co.uk. Now, I remember Jimmy Cricket vaguely from being a child. If anyone can remember more than I do then you’re in for a treat. 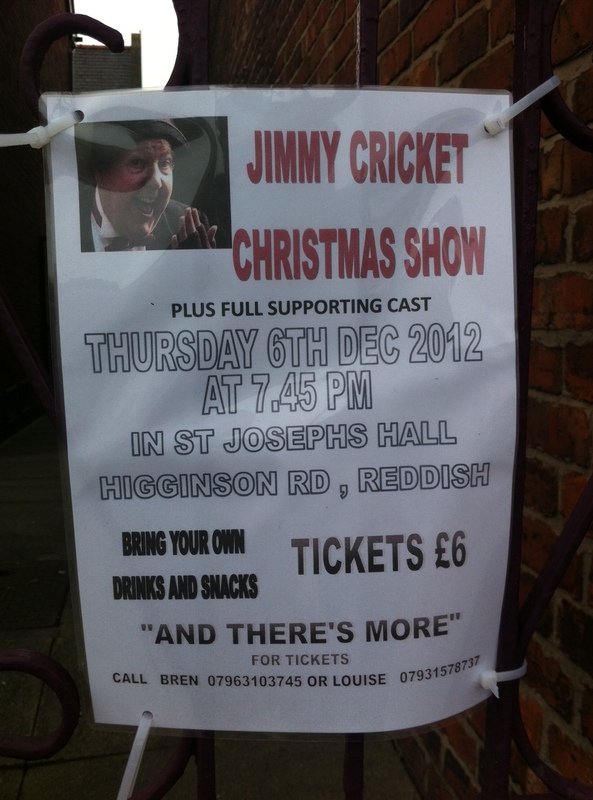 Jimmy Cricket is performing this Thursday 6th December at St. Joseph’s Hall. Full info found in the badly taken photograph below. If Jimmy Cricket wasn’t enough excitement for you, then on Friday night, there’s a cabaret night with disco being held at Houldsworth Working Men’s Club. Tickets cost £3 each or 2 for a £5. The best part is that all proceeds go towards Reddish Villa Junior Football Club so you get to be entertained and help the local community. Full info here. If you’re recovering from the shock of Jimmy Cricket turning up in Reddish then you might be equally surprised to heat that Reddish has a shop specialising in Witchcraft? Spirit of the Forest, located at 446 Reddish Road, serves all your witchcraft needs. Now, I’d give you more information on it but the website has a really bad font that hurts my eyes and a video that plays on the main page. These are up there alongside my pet hates. If it is something that would interest you, check out their website here. This concludes part 1 of the update. Part 2 involves me sifting through all of those profiles for local businesses that are set up as friends profiles. You know who you are! It’s no secret that here at Reddish News we love all things confectionery based. Imagine our excitement when we heard about a milkshake bar opening up on Broadstone Road. Luckily for us, we were able to grab a few quick questions with owner Andy to ask him all about this new business venture. Hi Andy, when I first heard the rumour about a milkshake bar in Reddish, I thought “why?”, so, why? Even as far back as when I first saw the place, I always wondered what if Reddish had one to work alongside the sunbed shop (editor’s note – Andy also runs Glow next door) I have there but it’s only this year the thought became more if a serious consideration and now a new start up business. When I driving by recently I saw a queue of schoolchildren clambering to get in, is that your main target audience? If you drive past midweek, I have to agree that you’ll see scores of school children cramming themselves in from wall to wall – however this isn’t our target audience specifically although it has become one of out stronger audiences. 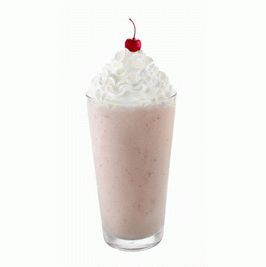 We also target gym goers (protein & fresh fruit shakes) and the confectionery shakes are ageless. Whilst I love milkshakes and I’m happy to go on record as saying that I loved my Dime bar one, do you do any healthier alternatives or smoothies? We understand the importance of ‘healthier alternatives’ and do have – as mentioned – fresh fruit options with fruit smoothies becoming available in time for Summer 2013. We also sell fresh fruit bowls and healthy option cereal/breakfast bars too. Is there any plan to cater for the non milk drinkers with soya alternatives? At present we don’t have anything in place to cater for non milk drinkers but hopefully at some point once we’re settled and trading steadily, we can arrange to have things in place for this type of shake in the future. What are the best milkshake combinations? MyShake is at 63 Broadstone Road, open 7 days a week. For more information, send questions to their twitter. Having recently attended the re-opening of the Broadstone Mill outlet village, I have to admit that I have nothing but positive things to say about it. Admittedly, the target age range is slightly higher than the demographic in which I currently sit, but with the new book selection and kitchen range, I find myself popping there on a semi-frequent basis. The opening up of the second floor which connects the arts and crafts area and increases the ladies clothing area was a masterstroke. They have scones and danish cakes, people. SCONES AND DANISH!!!! 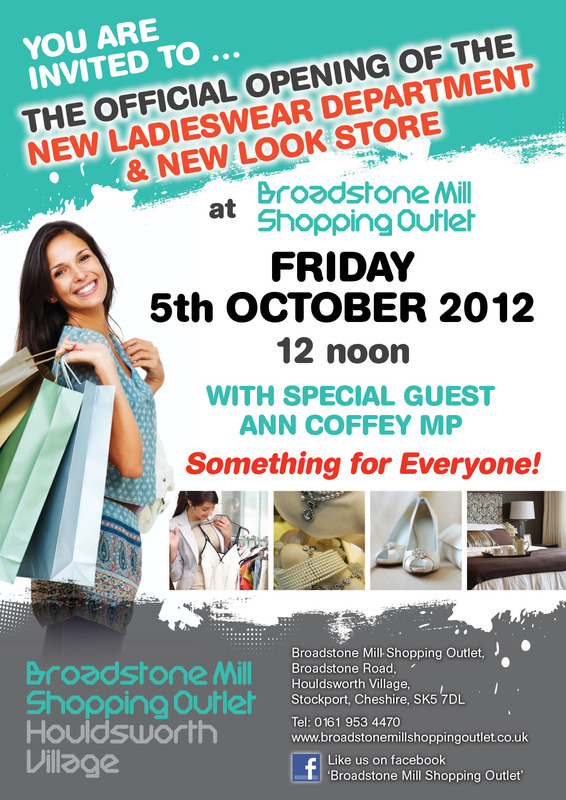 Broadstone Mill Shopping Outlet has a new look and it wants to show it off this Friday 5th October! Not only has the mill had a makeover but it’s also got a brand new ladieswear department packed full of all the great clothes and accessories a girl could want! So what are you waiting for? Get down to Broadstone Mill Shopping Outlet on Friday the 5th October from 12 noon to see for yourself! You’ll be in good company as not only are some of the Reddish News team going to be there to take a peak, but MP Ann Coffey will be there too! We all know someone, be it a family member, friend or simply a friend of a friend whose life has been affected by cancer. This Friday 28th September Taylor’s Glass will be holding a coffee morning to raise money for Macmillan Cancer Trust. 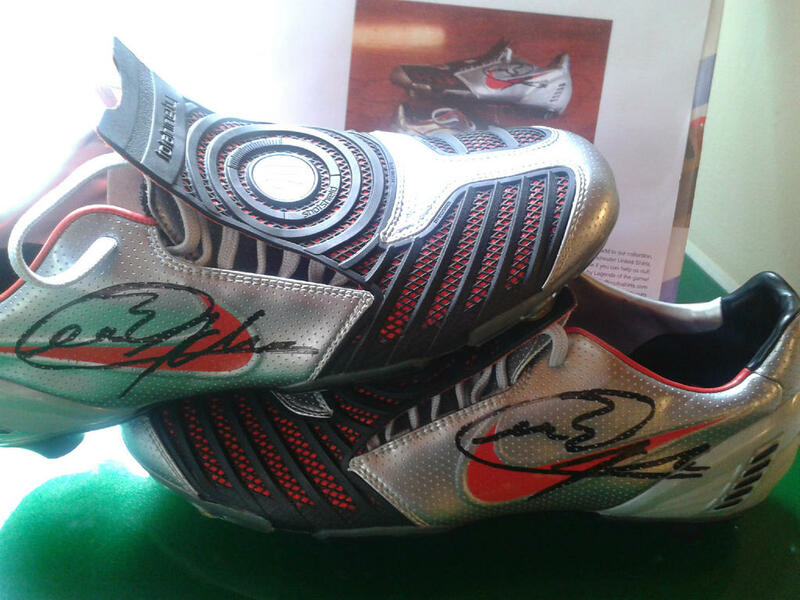 Nike football boots signed by Patrice Evra. Donated by MUFC Shirts. Childrens Bike. Donated by BL Car accessories & Cycles. Meal for 2. Donated by The Phad Thai. Temple Spa Gift Set. Donated by Nadine Loxham. Fill the sweetie jar. Donated by Candy’s & Cards. Wine. Donated by Omega, Bredbury. Wine & Thorntons Chocolates. Donated by P.W Sugden & Co.
On top of that there will be various handmade stalls selling plaques, jewelry, cards and more. The event will be held at Taylor’s Glass, 215 Gorton Road, Reddish, SK5 6LQ from 10am-1pm and everyone is welcome to pop in. For more information on general Macmillan Coffee morning events click here. For information on Taylor’s coffee morning, check out their twitter or website. Cancer is something that both directly and indirectly affects so many of our lives, together we can help to support those people and their families battling the disease. A few weeks ago at Reddish News, we posted a story about a potential ‘You Say, We Pay’ event happening. Well, we were pretty much on the money (or maybe that should be in the money?) with our information. The pot of money available is around the £30,000 mark and applications for between £250 and £2500 are welcome. They will be viewed and shortlisted by a panel which will then go on to a community voting event. The deadline for applications is Friday 12th October 2012. The voting event will take place at Reddish Vale Technology College on Saturday 17th November between 11am-2pm. Last week my boyfriend and I popped into new takeaway Tiger Chilly, which is located next to Barclays on Houldsworth Square. 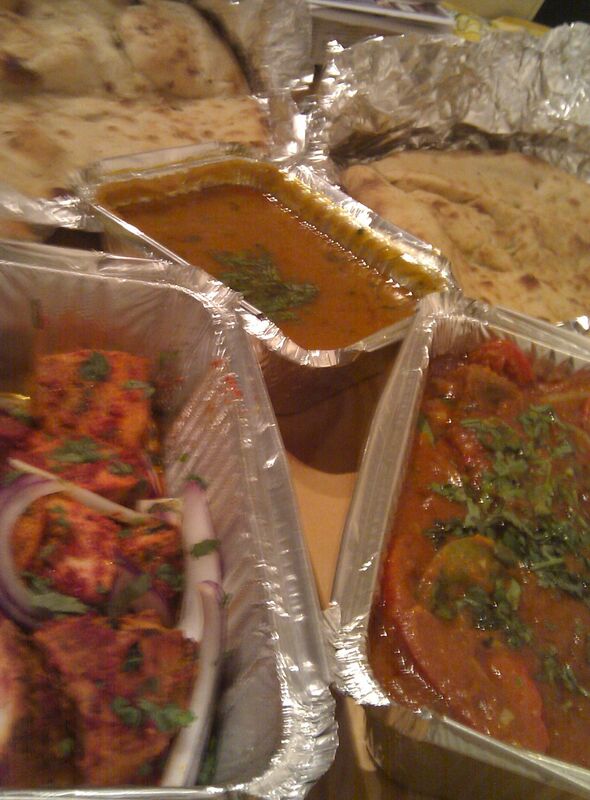 Even though I’m a Brummie we don’t have Indian very often so I was really excited to give it a go. The takeaway is a family run business and the guys that work in there are friendly and welcoming. The updated interior is modern and clean, and you can relax on a sofa whilst waiting for your food. One of my favourite things about Tiger Chilly is that you can actually watch your dinner being cooked, so you can see the level of skill needed by the chefs, and you can also see the freshness of your food. The quality at Tiger Chilly is outstanding, the meat is tender and the sauces are packed full of fresh ingredients. In my boyfriend’s case this was a lot of mean looking chilli in his beef jalfrezi! My chicken tikka was much gentler as you would expect. Both the starters and mains were delicious. I always judge an Indian by its sundries and Tiger Chilly did not disappoint. We shared a garlic and a keema naan, and I can honestly say they were two of the best naans I’ve ever tasted. Fresh, chewy and full of flavour. 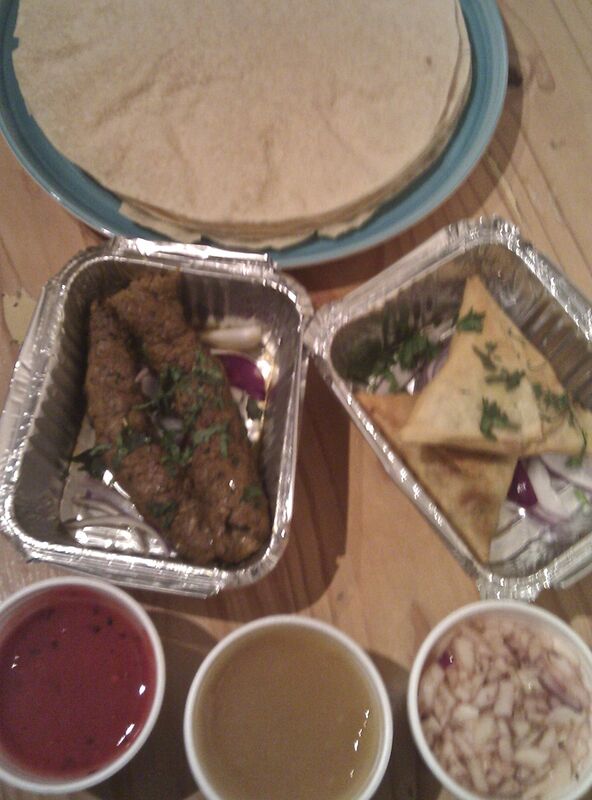 The poppadums did not let me down either – crisp and not too fatty. Perfect dipped into Tiger Chillys own chilli sauce. I was also impressed by the value for money, all of our food came in at under £20 and we were absolutely stuffed after our feast and there was plenty left for the next day. Tiger Chilly have kindly offered 10% discount to our readers – just mention that you read our site when you collect your order*. There’s an advert/menu available here. *Offer valid on collection orders only and may be withdrawn at any time without notice.